CHRISTINE POULSON » Miss Marple: Proto-feminist? Scarcely, and yet . . .
Miss Marple: Proto-feminist? Scarcely, and yet . . .
I’ve been reading with great pleasure Virginia Nicholson’s excellent, Singled Out: How Two Million Women Survived Without Men after the First World War. 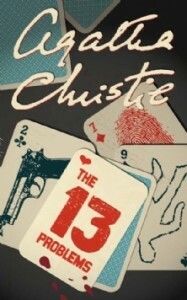 In a chapter on the stereotype of the spinster I was interested to come across this as an example: ‘Agatha Christie’s knitting detective Miss Marple incarnated the spinster sleuth.’ Last week I was reading The Thirteen Problems, stories featuring Miss Marple, and it seemed to me that here Virginia Nicholson rather misses the point. Miss Marple only appears to be a stereotypical English spinster, unworldly and ineffectual, forever fussing with her knitting. In fact she is anything but. In The Thirteen Problems she is pitted against a solicitor, a clergyman and Sir Henry Clithering, retired Scotland Yard commissioner and beats them all hands down and this in the 1920s and 1930s. Agatha Christie has plenty of fun here – there is a lot of quiet humour generally in her books – at the expense of everyone who makes the mistake of underrating Miss Marple. She may have spent a sheltered life in St Mary’s Mead, but she knows all about the seamy side of life: housemaids ‘in trouble’, wives murdered by husbands, lives ruined by ill-founded gossip. Miss Marple is in fact a pretty tough cookie and has no compunction about seeing murderers sent to the gallows. She is such a familiar figure that one is inclined to forget what an original creation she was. Yes exactly, I so agree.